The Story: A pod of false killer whales had been busy visiting dive boats at Roca Partida for a day. Twice they surrounded us on the M/V Valentina, and we could hear their distant squeaks and whistles underwater as we dove around the island. I was leading my first international dive trip on a second visit to the Revillagigedo Archipelago and loving our luck! We had not seen false killer whales the previous year, though sightings have been reported by others on occasion. 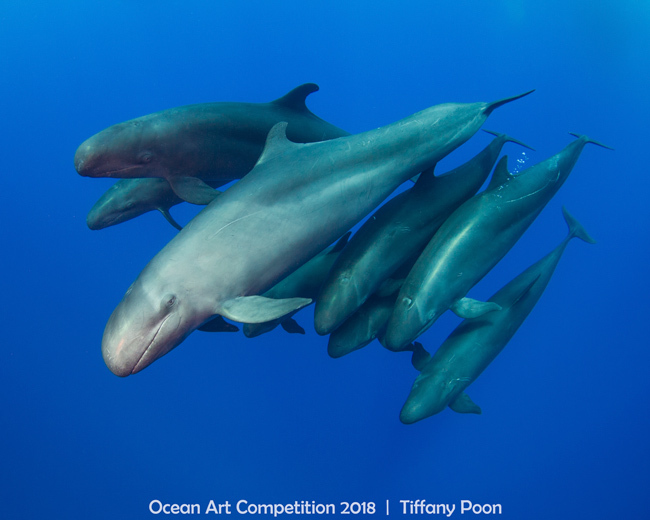 The next morning at the end of our first dive, their commotion grew louder and louder until suddenly there they were, the whole pod making a beeline to our dive teams. We all froze in place, stunned and suddenly ignoring the oceanic manta behind us. One subgroup turned directly in front of me and let me capture their family portrait. The little ones shyly looked around, but their leader watched me closely as they passed. Scientific name Pseudorca crassidens, false killer whales are a species of large oceanic dolphin first described from a Middle Pleistocene fossil and once thought to be extinct. They grow 16 to 20 feet in length, are found worldwide, and can travel in pods of over 500.